Liverpool are proving impossible to halt at the start of the Premier League season, with victory over Southampton at Anfield making it six wins from six for Jurgen Klopp and his players. The Reds had inflicted the necessary damage on Mark Hughes’ Saints by half-time, by when a Wesley Hoedt own goal, a Joel Matip header and a close-range finish from Mo Salah had earned them a 3-0 lead. 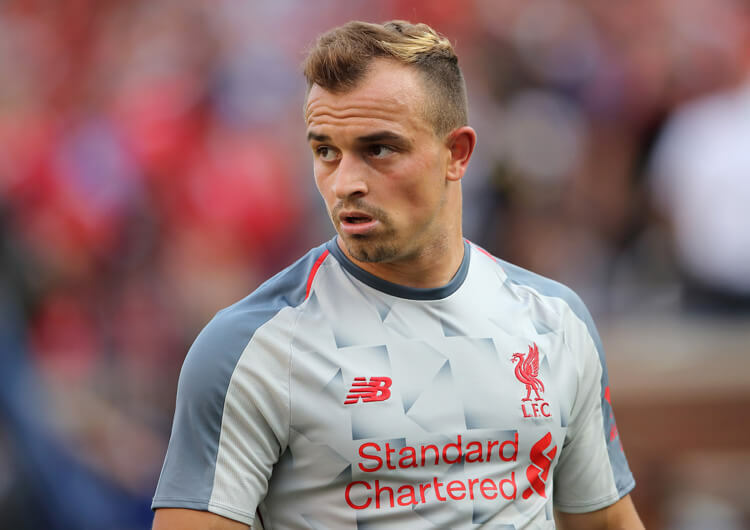 Xherdan Shaqiri, who was substituted at the break for tactical reasons, was named in the starting line-up for the first time since signing for the club from Stoke City in the summer, and played his part in the first and third goals. Chelsea’s goalless draw with West Ham leaves Liverpool as the only team to have maintained their 100 per cent start to the season, and the Reds now prepare to face the Blues in back-to-back fixtures: in the Carabao Cup on Wednesday and the Premier League on Saturday. Liverpool set up in a 4-2-3-1 for the first time this season, with Jordan Henderson and Georginio Wijnaldum operating as the deep-lying midfielders. 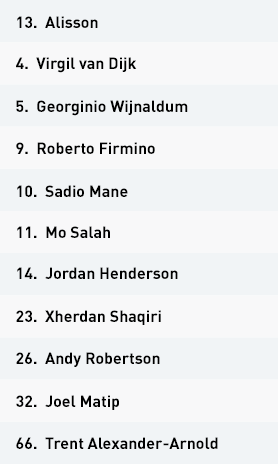 Sadio Mane played on the right of the attacking midfield trio, with Roberto Firmino on the left and Xherdan Shaqiri, making his first start since signing in the summer, in the number 10 position. Mo Salah led the attack. 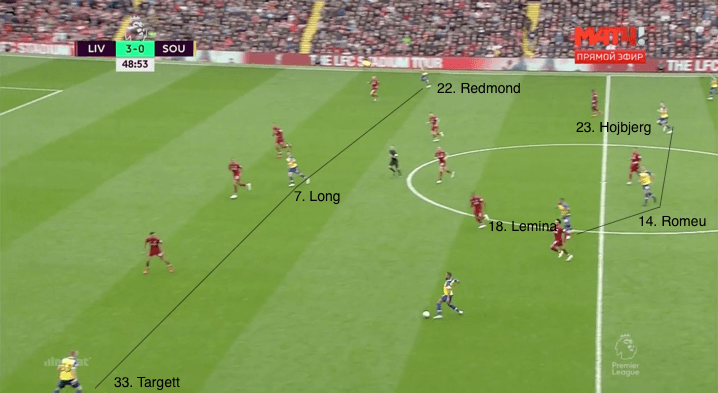 The Reds offered regular rotation between all three units in the team when in possession – this was carried out in an attempt to move the Southampton players out of their mid-block slots and create gaps to penetrate. While rotating, it was important that they still had players stretching the pitch horizontally and vertically, in order to facilitate a switch of play if the immediate path through remained blocked. 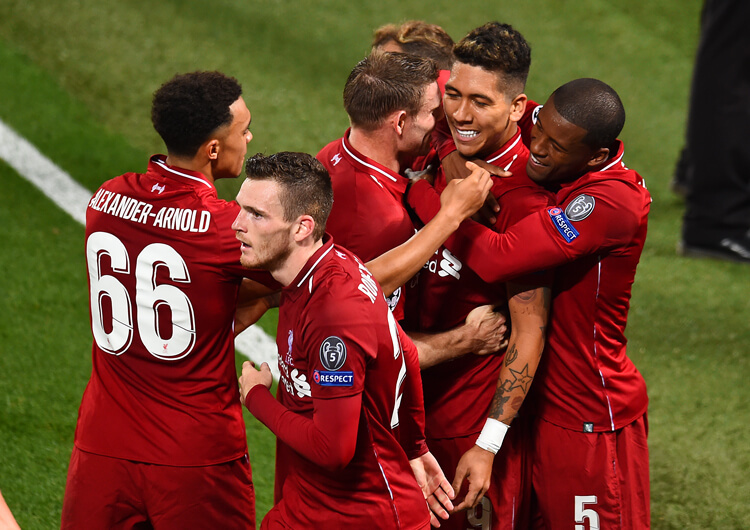 In central midfield, Henderson tended to stay deep to provide security in front of centre-backs Virgil van Dijk (later replaced by Joe Gomez) and Joel Matip, while allowing full-backs Trent Alexander-Arnold and Andy Robertson to surge forward. Wijnaldum was much more dynamic; he could regularly be seen making runs beyond Firmino to offer a threat in behind. At centre forward, Salah similarly looked to threaten the space in behind to encourage the Southampton back line to retreat – this could potentially increase the space between the defensive and midfield lines, allowing Shaqiri to operate in the pockets and receive the ball on the half-turn to play forward. It might be a concern to Klopp that this high level of movement and rotation only yielded five shots on target throughout the game. Fortunately, three of these found the back of the net. Interestingly, Klopp opted to replace the influential Shaqiri – who had played a key role in the first and third goals – with James Milner at half-time. 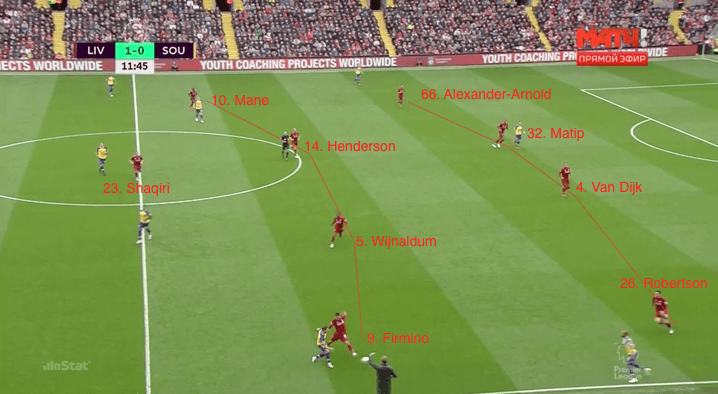 Unconvinced by the defensive performance of his side in a 4-2-3-1 system during the opening period, Klopp reverted to a familiar 4-3-3 structure for the second half. The Reds operated in a 4-4-1-1 mid-block out of possession during the first half. Mane and Firmino would tuck in with Henderson and Wijnaldum to form a midfield line of four, while Shaqiri sat just ahead of them. The idea here was for Shaqiri and Salah to encourage the ball out to one side of the pitch and try to shut off the other. The ball going into full-backs Cedric Soares and Ryan Bertrand, or Nathan Redmond and Matt Targett further up, was a trigger for Liverpool to attack with three players: the full-back and wide midfielder on that side, together with either Shaqiri or Salah. 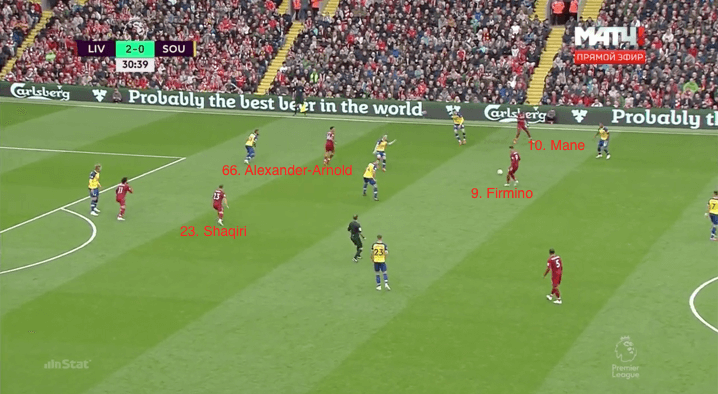 When they switched to a 4-3-3 in the second half, they operated out of possession as they have done for most of the season: fleeting between a mid-block and a high press. 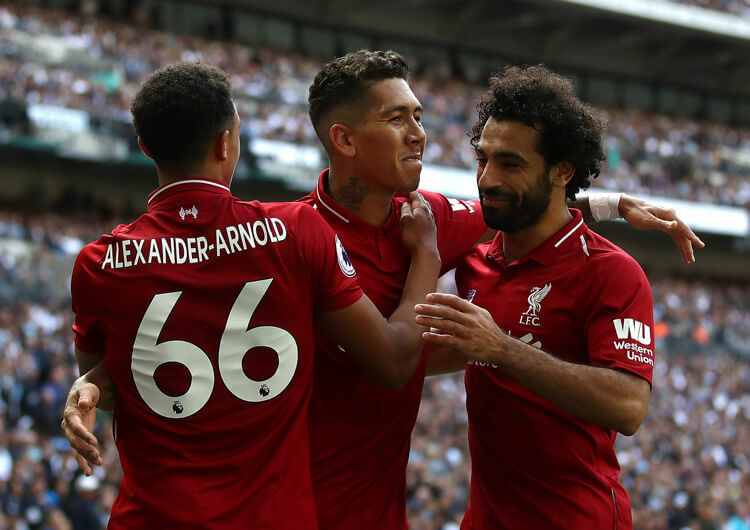 Due to their dominance throughout the contest, though, they rarely pressed with significant intensity in what was a sixth Premier League victory out of six for Liverpool. Liverpool set up in a 4-2-3-1 in possession during the first half, with Xherdan Shaqiri operating as the number 10, and Georginio Wijnaldum and Jordan Henderson as the deep-lying midfielders. This changed to a 4-3-3 upon James Milner’s introduction in the second half. 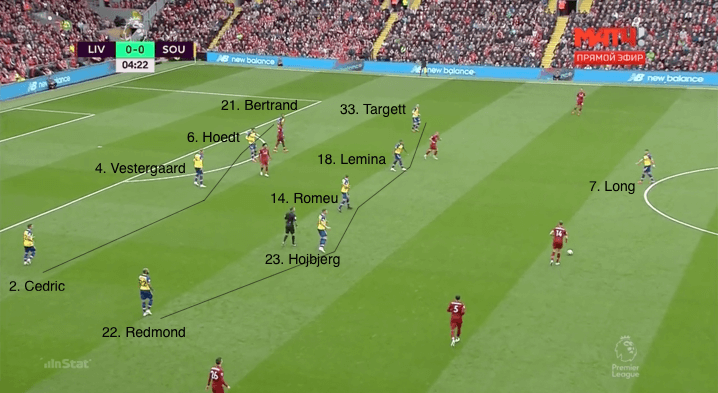 Out of possession, Liverpool spent the majority of their time in a 4-4-1-1 mid-block and tried to show Southampton into the wide areas with the aim of trapping them. Wijnaldum was the more dynamic of the Reds’ two central midfielders, regularly making penetrative runs beyond Roberto Firmino, who would drop deeper. Liverpool rotated their players on a regular basis in order to try to pull Southampton’s players out of their block and exploit the space that would be vacated. Here, it is right-back Trent Alexander-Arnold pushing up to join the front line of the attack, while Sadio Mane drops deeper. Southampton set up in a 4-3-3, with Matt Targett and Nathan Redmond supporting Shane Long in attack from the wide areas. Out of possession, Southampton operated in an organised 4-5-1 mid-block with the halfway line as their line of engagement. 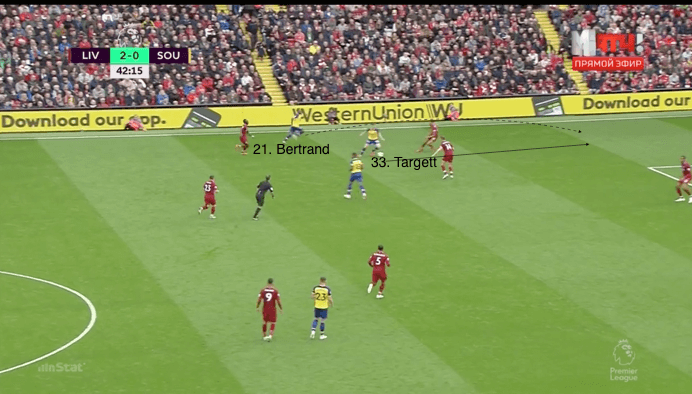 The relationship between the Saints’ full-backs and wide attackers was integral in their desire to exploit the space behind Liverpool’s full-backs. It was their occasional success in these areas that prompted Jurgen Klopp to shift his formation at half-time. 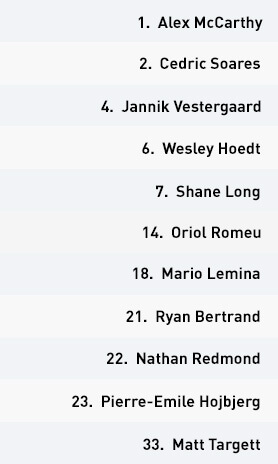 Southampton set up in a 4-3-3 system, with Oriol Romeu as the deepest midfielder and Pierre-Emile Hojbjerg and Mario Lemina either side of him. Matt Targett and Nathan Redmond supported Shane Long in attack from the wide areas. The Saints were limited to only two real options in possession: to exploit the wide areas, or switch play quickly to attack the more vulnerable side. 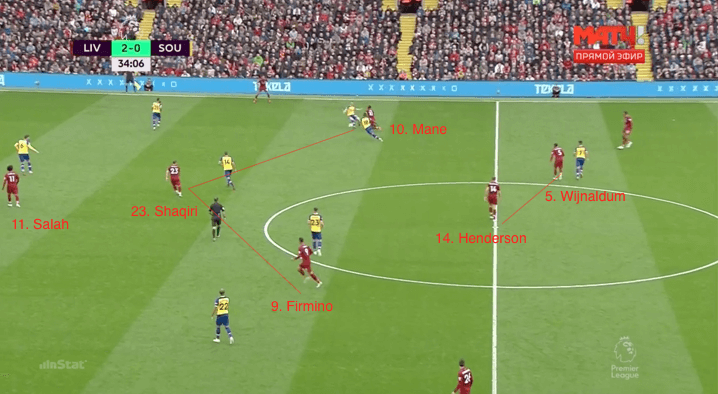 The relationship between the full-backs and the wide attackers was important in isolating Liverpool’s full-backs and exploiting the space in behind in the wide areas. Their players struggled to achieve this in one-on-one situations, so instead relied on combination play – which is how their rare attacks came about. When they were successful in getting in behind full-backs Trent Alexander-Arnold or Andy Robertson, they favoured delivering low crosses into the six-yard box for the runs of Long, or looked for cut-backs to their midfield runners. It was clear the Saints had recognised that aerial deliveries would have been unrewarding against centre-backs Joel Matip and Virgil van Dijk, and goalkeeper Alisson. They operated in a disciplined, well-organised 4-5-1 mid-block out of possession, which focused on denying their opponents any opportunities to penetrate. While the final scoreline suggests the visitors were outplayed, the three goals frustratingly came from set-pieces, with Liverpool rarely exploiting weaknesses in Saints’ defensive structure. Their line of engagement was the halfway line; any play within the hosts’ own half was left alone. 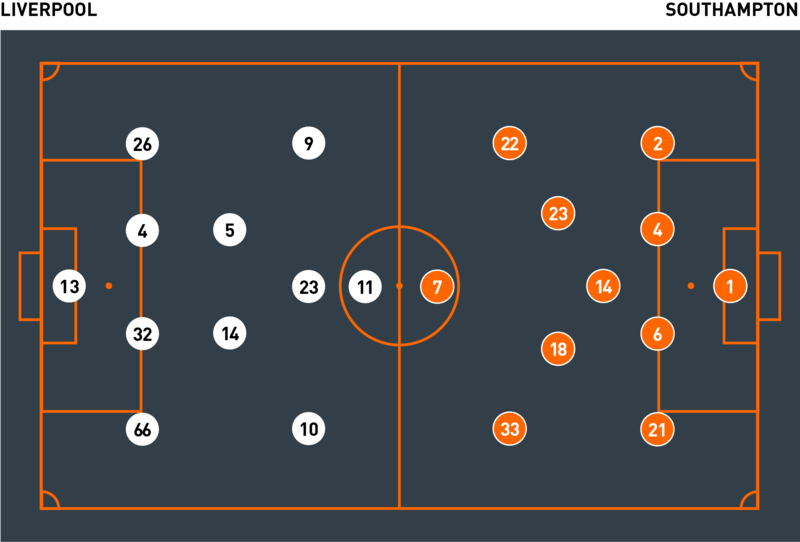 They opted to defend against their opponents in one half of the pitch rather than the whole pitch, making compactness much easier to achieve. With their strategy centred around minimising their vulnerability when out of possession, they were more likely to apply higher pressure in the wide areas than centrally. The visitors initiated an intense press further up the pitch only when in transition. 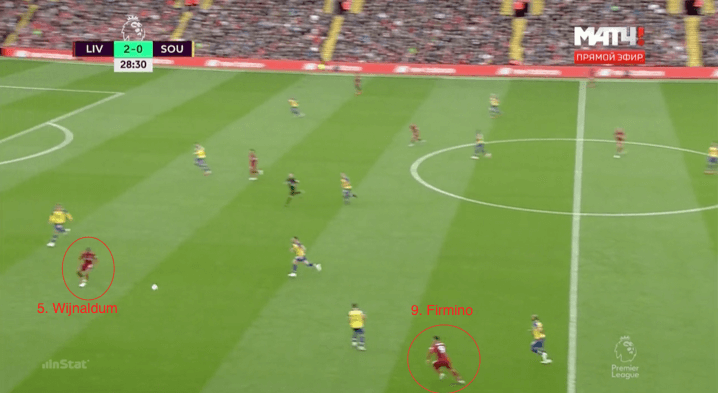 If they were successful in regaining during this period, they then had the opportunity to attack; if Liverpool broke the press, they would quickly try to reform the mid-block. Mark Hughes’ players were not as poor as the final result suggests, but the victory was never in doubt for Liverpool at half-time. Southampton displayed little desire or inventiveness in attacking the Premier League leaders, instead focusing their second-half efforts on avoiding conceding more. The signs are that it could be another challenging season.